Join this Awesome Community and receive free email updates! 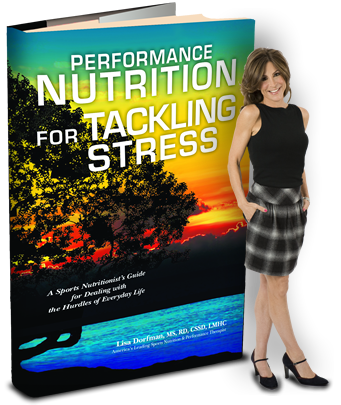 Lisa shows you how to tackle the everyday challenges and unforeseen extraordinary events with food, fitness and complimentary strategies . She shares cutting-edge research, the personal stories and heirloom recipes of other stress survivors from my private practice & all over the world. From surviving a near-death head-on car crash with a drunk driver, to experiencing the 150-mile per hour winds and loss of her home to Hurricane Andrew, suffice to say Lisa knows a little something about dealing & healing from the catastrophic and everyday stress of life. In this book, Lisa coaches you through the science and strategies for tackling what Lisa calls, the “stress fractures” of life whether it’s raising your toddlers or teens or training for your first marathon. Best of all, she shares the latest evidenced-based research on stress & diet & the personal stories of inspiring men and women from all over the world along with their heirloom healing recipes. The American Red Cross Disaster Relief Fund. The National Center for Health Statistics (NCHS) estimates that the majority of men & women experience 4 or more major stress events during their lifetimes.